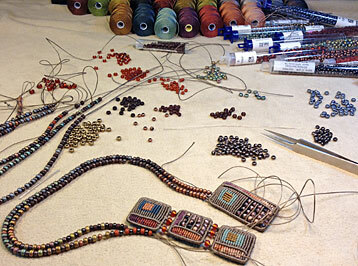 To receive e-news about future workshops - Sign-up for email newsletters regarding workshops! No workshop or classes are currently scheduled - Contact Marion if you are interested in scheduling a class. 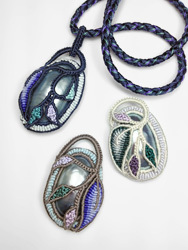 On the first day, learn how to set a cabochon in a micro macrame setting with nylon & silk thread. The second day, learn how to knot leaves, stems and flowers. 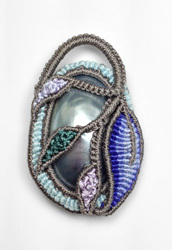 This workshop teaches a method to set cabochons without the use of any glue, by caging the cabochon with bonded nylon and silk thread and double half hitches and a wire armature. It will also introduce free-form Cavandoli knotting techniques. The finished piece will be a brooch or a medallion. 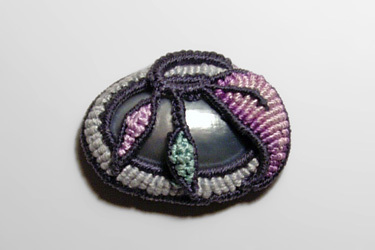 This class is the foundation for setting cabochon and knotting free open forms in a Cavandoli style. Once the technique is aquired, it can expanded to larger pieces. 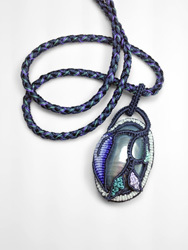 Please note that the braided cord for the medallion is not taught in this class. Cavandoli is a specialized knotting technique in which double half hitches are knotted in a continuous fashion, with no loose thread or spaces between the knots, creating a woven-like tapestry. 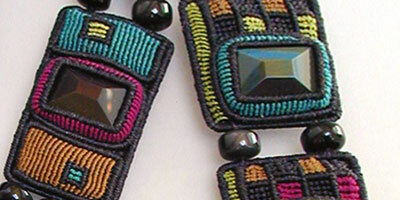 Traditionally two colors are used and patterns are created by alternating horizontal and vertical double half hitches. Refer to a blog entry done on Cavandoli and who was Valentina Cavandoli for more info on this technique and its history. Cavandoli 2.0 will take you beyond the two color limitation. A series of techniques will provide you with the tools for color control and to be able to bring a color exactly where you want it. With the use of wire armatures, vertical, horizontal and reverse double half hitches, we will create module like textile pieces. Texture and relief will be explored. The pieces we will create will be planned and structured. These modules will become the focus pieces for a beaded opera length infinity neckpiece with no clasp, or a cartouche medallion. 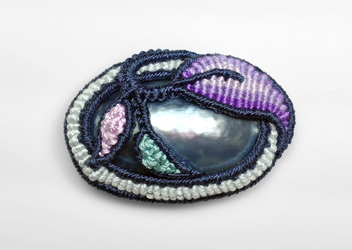 Class projects are made with C-Lon Bead Cord and various seed beads and are available in several color schemes, so you will be able to choose your own color variations. Keep in mind that Cavandoli is a slow process with lots of knots per square inch, so the projects will most likely not be finished in class. Practicing of the double half hitches before class is required! 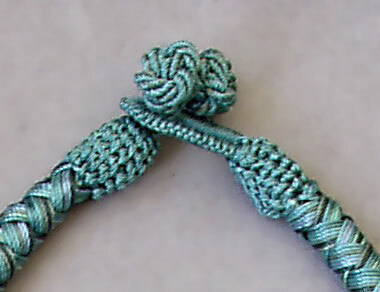 > double half hitch tutorial #1 (pdf) or view as an html page or tutorial #2 (pdf). It will make all the difference! 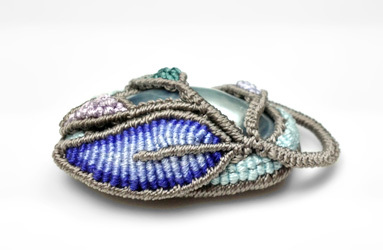 Learn how to tie 4-strand crown knots with the use of a kumihimo disk, a method that makes this process much easier to learn and master. 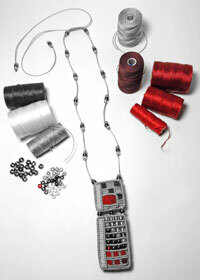 Plus learn how to integrate a clasp with a button and loop seamlessly with no loose thread or thread ends remaining. Please note: A bracelet will be made during class. 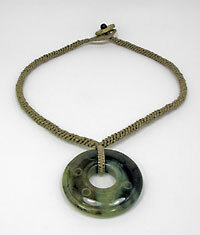 Larger projects such as neckpieces can be made after the class. 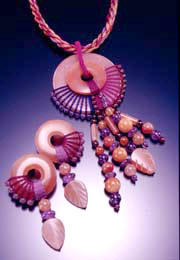 Create your own amulet, brooch or earrings with a silk fan and bead edging around a gemstone donut or pie. We will explore several methods with the use of charts and hands-on demonstration. This class is appropriate for various levels of experience. 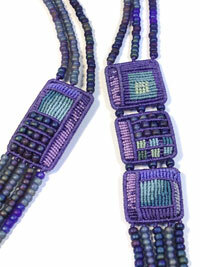 We will explore several methods to create cording: rope making and braiding with a limited use of tools. 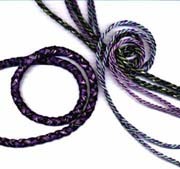 With charts and hands-on demonstration we will make various types of cording and discuss their possible uses. This class is appropriate for various levels of experience. The Turk's Head is a beautiful ornamental knot made with one thread/cord only, similar to a braid. 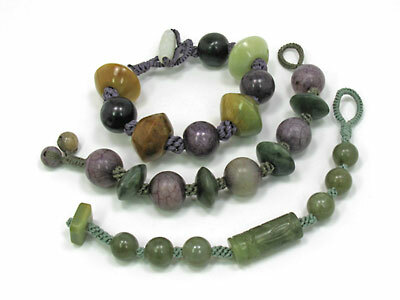 It is used extensively in Chinese Knotting, Japanese and Celtic designs and for tassels. Historically on ships it was used on hand railing, around stanchions or on a hammer handle to secure a firmer grip. 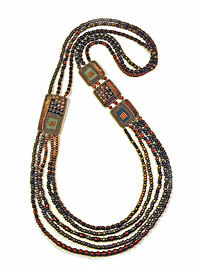 It is made around a larger object such as a larger cord or tube, to add a contrasting color or to join several cords. It can also be used as a covering. 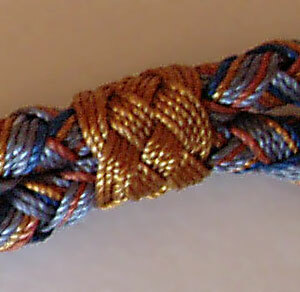 The golden Turk's Head shown here is joining the two kumihimo braids together. This particular one is a Five-Strand Turk's Head with 5 passes. 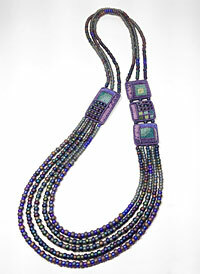 Create a neckpiece using a simplified kumihimo braid that can be made without the use of a maru dai, saving yourself the hassle and the expense of purchasing it. Sterling silver clasps for finishing the cording will be available for purchase. 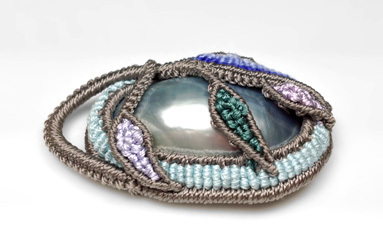 How to End Kumihimo Braids and Make Clasps! 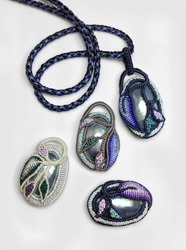 Kumihimo cords present a unique challenge to finish. How to integrate a clasp if no metal tubular findings are desired... 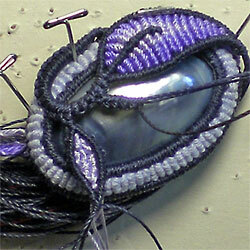 Learn how to secure the threads at the end of the braid by wrapping and covering them and create a fiber based clasp. Students will apply one technique learned in class based on knowledge and experience with knots, such as the Chinese Button Knot and Turk's Head. Written and illustrated directions for all the techniques shown in the class are included in the manual. Kumihimo will not be taught in this class. 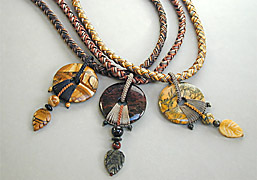 Bring your kumihimo cords to finish or you will be provided with a braid to finish at the class. This class is a technique only class. No actual finished piece will be made. Create your own amulet around a gemstone donut or pie. Explore several techniques with the use of charts and hands-on demonstrations. We will make a 3 ply cord, learn how to wrap the donut with lark heads knots and master the beautiful Chinese button knot. 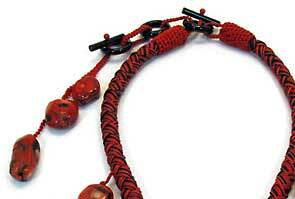 This knot or rather perfectly symmetrical braid is used extensively in Chinese designs. It makes a fabulous button as well.